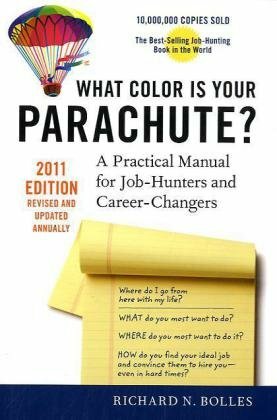 I am told that the all-time best selling book on finding a job (more than 8 million copies sold) was written 37 years ago by an Episcopalian clergyman who lost his job as a pastor in San Francisco in what we today call a downsizing. Richard Nelson Bolles’s experience in losing his job, successfully finding another, and his subsequent book, What Color is Your Parachute?, changed the way people looked at the job market and transition in their lives and, I’m told by my friends at Big Ben Bookstore here in Prague, that the book has been published in Czech. What is so compelling about Bolles’s work is its common sense. Recently, I was going through some papers and came across an interview that Daniel Pink did with Bolles in 1999 for Fast Company magazine in which he offers a powerful insight into the mechanics of looking for a job. For years I have advised people to employ a technique I call the “List of 10”, which can be found on-line in the Hospodarske noviny archives, in my May 9th, 2006 column titled “How to Find the Job You Really Want”. It wasn’t until I read this interview, though, that I gained a new perspective on the vast difference between how employers look for people to hire and how people who want to be hired go about finding each other, and I want to share it with you in the hopes that it will change the way you go about looking for a job and that it will increase the likelihood of your success. In the interview, Bolles describes a pyramidal diagram showing the progressive steps companies typically take when looking for people they want to hire. His diagram is called “Our Neanderthal Job-Hunting System”. At the base of the pyramid, which is where companies begin the process, is “internal resources”-looking within the companies for someone to promote and also to leverage these internal resources for names of individuals known to current employees. Then they begin to move up the pyramid to other methods such as general networking, employment agencies, unsolicited resumes, and want ads. This is the way most companies go about looking for new people to hire. It just makes good sense to do it that way-start with people who know the company and its culture to see if they know of someone who might be a fit. Now, how do you think most of us as individuals go about looking for a job? Just the opposite! That’s why Bolles calls this a Neanderthal system–nothing about it has evolved or changed since the invention of want ads. Want ads are useful, to be sure. But if reading them is your only strategy for finding a job you need to consider the benefits of evolution and change your behavior. How, then, can you use this information to evolve and to find a job more efficiently before the “outside” world reads about it and knows that it is available and thereby give yourself an advantage over the competition? Simple. Begin your search at the bottom of the pyramid by talking directly to people who work for the companies you have targeted as highly desirable places to work and at which your talents and skills can be used. If you sat down right now and wrote down the names of just five companies that you would like to work for and which you know could use your skills and abilities and made meeting someone inside each of those companies your main goal, you would be surprised how much easier it is to accomplish than you think it is. The method for doing this is described in my previous column mentioned above, but for today, let’s take a look at why it’s so effective. It’s more effective because you go straight to the source. It’s the same approach we use in everyday life. Suppose you wanted to meet someone, say a man or woman whom you’d like to ask to dinner, whom you hadn’t personally met yet, how would you do it in a way that would increase the likelihood of that person accepting your invitation? You would ask someone to introduce you who knows you both and who has the respect of the person you wish to meet. Ideally, this person would also know enough about you to be able to describe your wonderful characteristics and to suggest an introduction. For many years in the business world we have called this technique “meeting someone on a favorable basis” and it is a powerful differentiator. So, apply this logic to your job hunt-spend more time working the bottom of the pyramid than the top and you will greatly increase the chances of your success. Good luck on the way up!